A palace has been located on this site since 1697 but the current one is much more modern with 18th century design. You’ll want to see the Royal Apartments which contain luxurious state rooms including Gustav III’s bed chamber, a banquet hall, guest rooms and the Hall of state. If you’ve visited other European palaces, then you’ll know what to expect and this is on a par with most of them. In addition to the apartments, there are several other areas in the palace which you can visit. These are optional extras really, so if they interest you, buy a ticket which includes them. The Treasury is a collection of crowns and important jewellery is held in the Palace vaults. 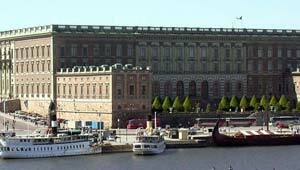 The Tre Kronor Museum is all about the Kronor palace which was destroyed in 1697. Gustav III’s Antiquities Museum is crammed with art that he amassed along with an impressive collection of sculptures.